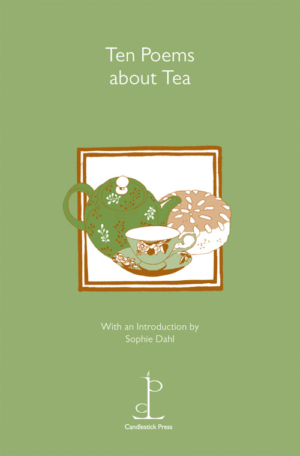 Ten Poems about Tea has a fabulous introduction by Sophie Dahl (PG with milk, no sugar) and was the brilliant idea of Picador poet Lorraine Mariner, who also works as a librarian in the Poetry Library at London’s South Bank Centre. She has helped choose the poems, advised us along the way and agreed with our view that the cover of the pamphlet should feature a good, wholesome Dundee Cake rather than the more fashionable, flirtatious and ubiquitous cup cake. Tea (like Dundee Cake) will not be going out of fashion any time soon and the ten poems about it will, we hope, give your tea-time new heights of delight. Perfect for those of us for whom, to borrow from the lyrics, ‘everything stops for tea’. As Kenny Knight rightly says in his poem ‘Lessons in Teamaking’, there was a time when, in the eyes of some, “the teapot was the centre / of the known universe”. We hope that you will enjoy these poems as much as we have. No tea should be slurped – from cup or saucer, we aren’t fussy – without them. Includes poems by John Betjeman, Jo Shapcott, John Agard, Eavan Boland and the cricket commentator, John Arlott.